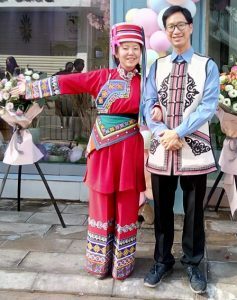 Wai Leuk, my nephew would be marrying his sweetheart Isabel, a girl of Baiyi (a minority group from Yunnan) in Hong Kong on December 29, 2018. 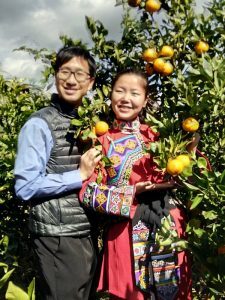 After their wedding in Hong Kong, they would return to Yunnan to host a few more events from January 2 to 5, 2019 in Isabel’s village and in Kunming. 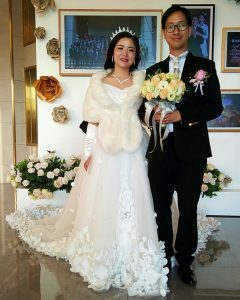 Lawrence (my younger brother) and Sally (my sister-in-law) invited me to join the parties in Yunnan. I was glad that my friends Bing, Judia, Kai, Regina, Sam, WT & YW could join. It’s the first biggest party my family has ever hosted! My elder brother Alan came with Vicki from Sydney. I invited my niece Shirley and her husband Leigh and two sons (Thomas and Asher) to spend a holiday in Hong Kong. Leigh and the boys have never been to Hong Kong. Our cousins Ricky, Wini and Alan came with their spouses (Ada, Bob and Ronnie) from North America. Wini’s sons, Paul and David, came as well. We arranged Isabel’s parents, her sister and husband and their two children to come. 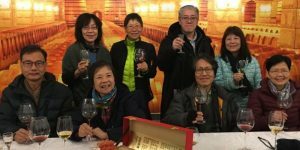 They flew for the first time in their life from Yunnan to Shenzhen on December 27 before taking a train from Lowu to the Hung Hom. As expected, the couple had a long day. Lily who would be the second bridesmaid rushed off to the hotel where Isabel stayed with her parents shortly after 7 am. Leuk and friends decorated the car before leaving for the hotel at 10 am. When Leuk brought the new bride to my flat around noon, Lawrence, Sally and I were still busy tidying up the place. My tiny flat was packed with 16 people! 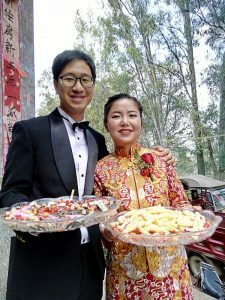 Isabel and Wai Leuk followed the traditional custom and performed a tea ceremony to their parents. They also paid respect to me and I gave them a red packet each. Instead of giving them money, I gave them two gold coins that I have kept since 1992. 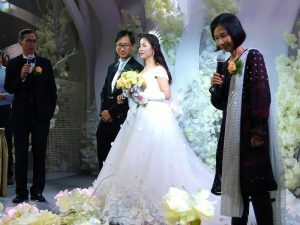 Isabel then took off the traditional red and gold Chinese bridal gown and put on a white lace gown with a 6m-long long veil. Isabel looked gorgeous. 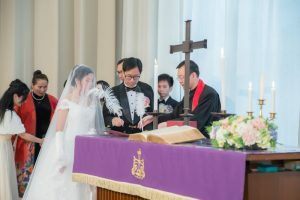 The ceremony took place at 3:45 pm in the chapel of the Chinese University of Hong Kong where Leuk graduated. 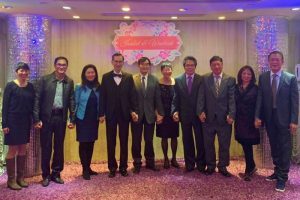 After the church ceremony, the party moved to the restaurant in Tsimshatsui. Lawrence hosted 16 tables for relatives and close friends. The most wonderful moment was when we took a WU family photo with 36 members. Next year, when Betty’s daughter, Stephanie gets married, the size will be even bigger! While Wai Leuk, Isabel and her family of 6 would be flying back to Yunnan from Shenzhen, our party of 15 (including Sally’s brother and sister (4 persons), my seven friends, Lawrence, Sally, Lili and I) would take the high-speed train. Unfortunately, the sudden heavy snow fall caused a 2-hour delay: we did not arrive in Kunming till almost 10pm. By the time we reached the hotel and had a bowl of noodle, it was almost midnight. Lawrence arranged a 35-seater bus to take the group of 15 to visit the Earth Forest. We set off after 8:30am and arrived around 11 am. After an early lunch, we entered the park where we spent two hours. 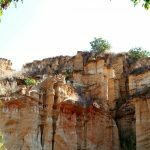 Yuanmou came to limelight in 1965 when two hominid incisors, some ancient mammalian fossils and signs of early stone tool uses were discovered in the area. These are some of the earliest evidence of the Homo genus’ existence in Asia. 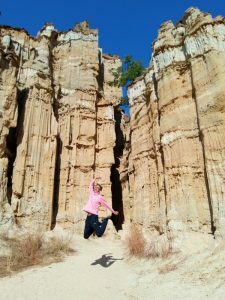 Then the Yuanmou Earth Forest formed one to two million years ago covering an area of about 50km2 gradually gained prominence (though still not as known and popular as the Stone Forest). 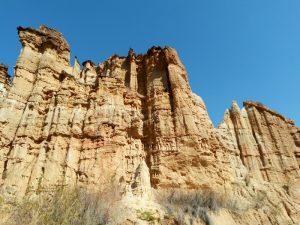 The features here are predominantly tan, beige and rusty tones and the tallest formation is about 40m high. 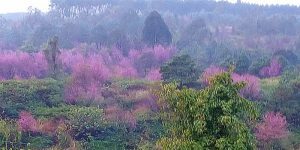 The attraction comprises three sightseeing areas at Banguo 班果, Langbapu 浪巴铺 and Wumao 物茂. The Yuanmou Man Museum 元謀人博物館 is located in Lanbapu. 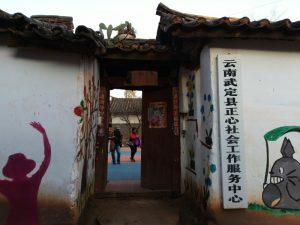 We had a half-price ticket (¥30) and had time only to visit the Wumao area. We paid ¥10 for a shuttle bus ride to the top of the rim. After having a panoramic view of earth forest from above, we descended into the valley and had a leisure stroll along a pedestrian path. The fascinating fairy-like formations crafted out by wind and rain are impressive. We departed before 3pm and arrived in a small village. We visited a NGO that provides services to children of migrant workers. These left-behind children who are often looked after by grandparents or relatives, are vulnerable to psychological and developmental problems. The CEO is a native who has established centres in a dozen villages. These days, the central government recognises the problem and has given some funds to support NGOs to help these children. This organisation has helped some 1,000 children over ten years. This centre is small but tidy with a small library. During weekdays, half a dozen of children come here after school. More children would spend the weekend under the care of the centre when they come back from their boarding school. We met three university students on internship at the centre. The cousin of the CEO slaughtered a pig that evening. It’s an important occasion and she invited us to join. The feast started around 4pm and we arrived after 5pm when most guests had gone. It’s a memorable occasion: we sat on stools around a low table in the courtyard. 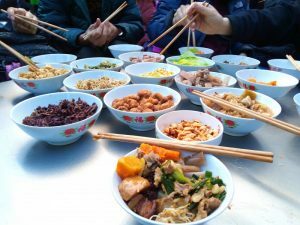 The food prepared by the family was simple and organic and was served in small bowls. Our host kept refilling the bowls. We had an authentic experience and the pork tasted most delicious. We left shortly after 6 pm. Lawrence invited the party to visit his old flat which is now the new home for Wai Leuk and Isabel. I contributed substantially towards the renovation work. I went to Kunming last September to decide on the scope of work with Wai Leuk and returned in November to oversee the work progress. I am pleased the flat now looks airy, spacious, cosy and comfortable. I hope Wai Leuk who is messy, is able to keep his home clean and tidy with the help of Isabel. Bing and I watched CCTV and saw fireworks in Sydney and celebrations all over China. We wished each other ‘Happy New Year’ before going to bed after midnight. 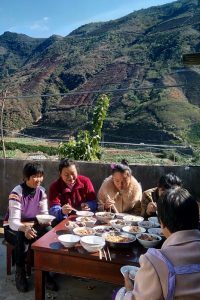 The wedding feast in Isabel’s village, Lu De He Village 祿得河村normally lasts for three days. 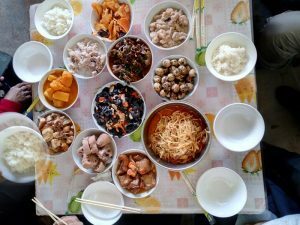 The food would be prepared by their close relatives in their village. 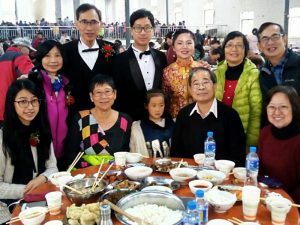 To make things simple, Isabel’s parents would host two big banquets in a community hall in Panxizhen 盤溪鎮 on January 2. They offered to arrange us to stay with their relatives in their village. As most of us have problem with squat toilet, we prefer to stay in a hotel in Panxizhen. Isabel’s parents told us that the guesthouse there could not take non-Mainland tourists. 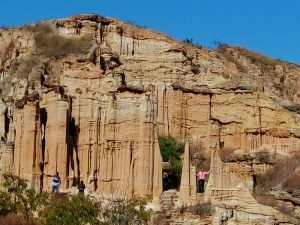 Hence, Lawrence arranged the group to stay in Mile, a popular holiday city with hot-springs about 150km from Kunming and 75km from Panxizhen. It was drizzling and grey. The driver drove so slowly that he took three hours to reach Mile which appears green and surprisingly tidy and prosperous with many shops and new malls. After lunch, we went to a winery which was first established by French missionaries about 150 years ago. 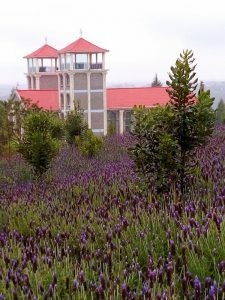 The area is now famous for its Rose Honey, a species of grapes unique to Yunnan. We had a VIP guided tour, saw the cave and tasted five types of wine and cognac. We also took a short walk to see the church below the winery. If the weather were fine, we could have spent another hour or two strolling in a nearby scenic park. But it was dull, grey and cold. We decided to return to the hotel and have an early hot-pot dinner. We paid under ¥200 for a twin room in a nice hotel. Very reasonable. 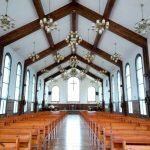 Today, the first banquet with 70 tables would be held at 10am followed by another banquet for 80 tables at 4pm. We were told to arrive in Panxizhen around 9am. We set off at 7:15am in a misty morning. The driver somehow took a winding village road instead of a direct route via G326 and S304. Looking at the Google Map, I supposed he wanted to take a short-cut and cut into S304 near Wushanxiang 五鄉山. Around 9:40am, we had to turn back as the bus could not get through owing to a height barrier. Based on the Google Map, we were not too far from Wushanxiang. We drove almost all the way back to where we had started. This time, the driver followed G326 before turning into S304 which was full of pot holes. When we arrived at Hongxizhen, we were stopped once again by a height-barrier. Had we taken a small vehicle, we could have driven through and arrived in time. The transportation company should have realised this problem and advised us to take a small bus. Not professional! The driver turned back the second time and made a detour before getting back on S304. We finally arrived at the community hall in Panxizhen around 1 pm. What an eventful journey! The morning feast was over when we arrived. We had an interesting tour of the kitchen where the ladies were cooking while the men lined up chopping meat on a long table. While we were having our late lunch, the entertainment programme for the couple began and lasted for an hour. Isabel’s mom and relatives were singing and dancing. Bing, Judia Kai and Regina who love singing, sang a Cantonese song to entertain the crowd. My friends left around 4 pm. Judia, Kai, Regina and Sam returned to Kunming and would fly back to Hong Kong the following day. Bing, WT and YW would spend two nights in a scenic lake area nearby. At 4 pm, guests began to stream in. 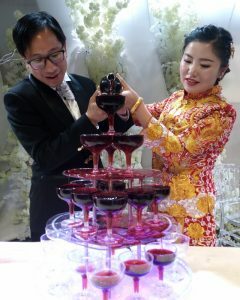 The couple greeted guests with sweets at the entrance. 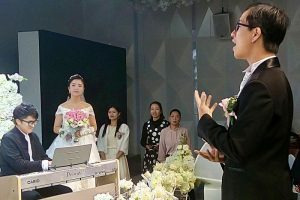 The guests sat down, ate and left while the couple remained standing for almost two hours. By sunset, the banquet was over as all guests returned to their villages. Tonight, Isabel’s father arranged us to stay in a local guesthouse which is decent, clean, spacious and comfortable. I wished we had stayed there the night before. I had a good sleep and did not get up till Lawrence called asking Lili and me to join them for a hot-pot fish breakfast. 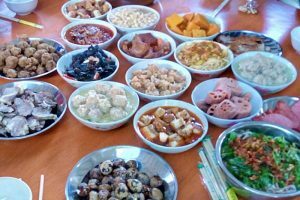 Foreigners can’t imagine how the Chinese people can have hot-pot and a full meal for breakfast! We were told to pack up and get ready at 10 am. 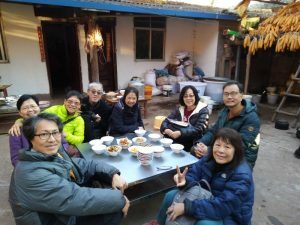 We would bring our luggage to Isabel’s village and her father had arranged three 7-seater vehicles to bring us back to Kunming after lunch. Isabel’s father turned up with two minibuses after 10:30 am. The weather was fantastic today with sunshine and blue sky. We were all in high spirit. By the time we arrived in Lu De He Village, it was already 11 am. I first came here with Lawrence and Sally in October 2017 when they called upon Isabel’s parents to discuss the wedding date and arrangements. As my passport was stolen in Madrid, I returned to Hong Kong early and was able to join my brother on his first meeting with Isabel’s parents. The whole region known as the ‘Home of Mandarin’ is covered with mandarin orchids. 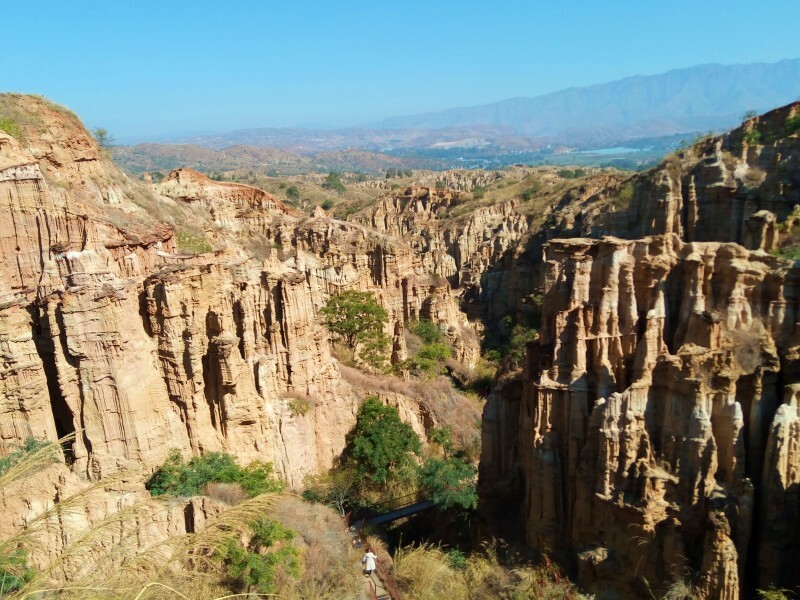 The valleys and surrounding hills are beautiful and lush green with countless mandarin trees and vegetable plots. Isabel’s parents and their relatives are all farmers. We were thrilled to find guests already having lunch in the courtyard. Life in the village is simple: they eat early, work hard and look happy, healthy and content. We had 11 dishes including beef, pork, prk skin, lotus, quail egg and pumpkin. By the time we finished our lunch, all the guests had gone and the courtyard had been cleared up. Life was back to normal again. Isabel took us to a mandarin orchid. 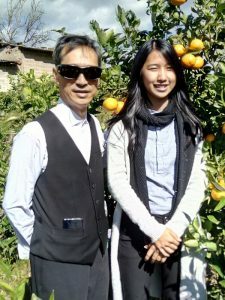 We also saw two jade melon fields belonging to her cousin who gets about 100kg a day (i.e. an income of about ¥200 a day during the harvest season). We returned to Kunming around 2 pm. I stayed in Lawrence’s flat while Sally’s brother and sister stayed in a hotel. We had a nice mutton hot-pot dinner. I did nothing and had a quiet day resting at home. Others were busy finalising arrangements for the next day. In the evening, I got the news that Bing had fallen and hurt herself. O God! Today’s the show of Wai Leuk and Lawrence. In the morning, Wai Leuk and Isabel would host a small party of 13 tables for their friends, colleagues, students and their parents. 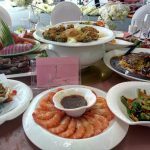 From 5 to 8 pm, Lawrence would celebrate the happy occasion with his friends and their families who took up some 27 tables. Isabel and Wai Leuk chose the venue and were in charge of the venue decoration. White hydrangeas provided a beautiful and romantic backdrop. Wai Leuk’s students sang the song ‘You Raised Me Up’. The video on the Hong Kong event made by his student George was shown followed by another romantic video made by Wai Leuk. Things went smoothly. The most moving moment came when Isabel talked about her growing up in the village and thanked her parents for their supports without which she could not have completed her university education. She is mature and speaks well. I am impressed. 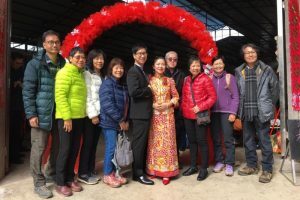 In the evening, Lawrence and Sally greeted over 250 friends they have made since moving to Kunming in 1999. The programme was different from those in the morning. Wai Leuk told the gathering how he met Isabel in the school. He appreciated his parents, sister and me for helping him. 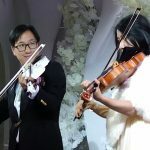 He and Lili played the tune ‘You Raised Me Up’ with their violin. He said Isabel would be his guiding angel. But the most moving moment was when Sally made her remarks mentioning her struggle with cancer about ten years ago. 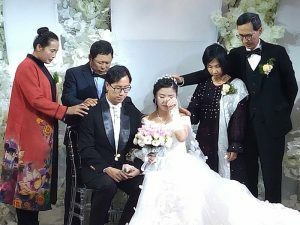 Being a cancer survivor, she is thankful to be able to see her son Wai Leuk getting married and her daughter Lili completing her first degree. Sally is strong and a great mom and wife. I feel proud of them! Mission completed. The party was finally over! Sally, Lawrence and I returned home while the young people stayed out and did not come home till 1-2 am. I am glad Isabel and Wai Leuk can finally enjoy themselves and getting ready for their honeymoon cruise to Japan on January 8. In between the two banquets, I was able to slip out to go to see Bing who was staying in a hotel in Kunming. We had a pleasant walk in a city park. I was glad that Bing had not been seriously hurt after the fall. She walked slowly with a stick but without much pain. She would fly back to Hong Kong direct the next day. Originally. I planned to return to Hong Kong by train. After the delay on December 30, I decided to fly to Shenzhen with Sally’s brother and sister before taking a bus home. I wanted to get home early so that I could meet Shirley, Leigh and their sons before they departed for the airport that evening. I left for the airport at 8 am. The flight departed on time at 11:45 am and I was on the bus leaving for Yaumatei by 3pm. I was home at 4pm and had dinner with Shirley’s family before seeing them off to the airport. I am close to Lawrence and his family. I have been watching Wai Leuk and Lili grow up. It is comforting to see both of them reaching important stages in their life. Wai Leuk is always a big child at heart with a baby face. He has found his better half and guarding angel. I wish them happiness and a wonderful journey ahead.